On the same day that a national newspaper carried the notice of my wife’s death, the front page had a headline to the effect that ‘Midwife Mistakes’ were responsible for many infant deaths and disabilities; now, two months later -to the day- a national paper returns to the same topic, but concentrating on the brain-damage aspect. She could have forewarned both the R.C.N. and Westminster of exactly this probable outcome, not least when Midwifery training was stripped of its requirement to be preceded by General training. 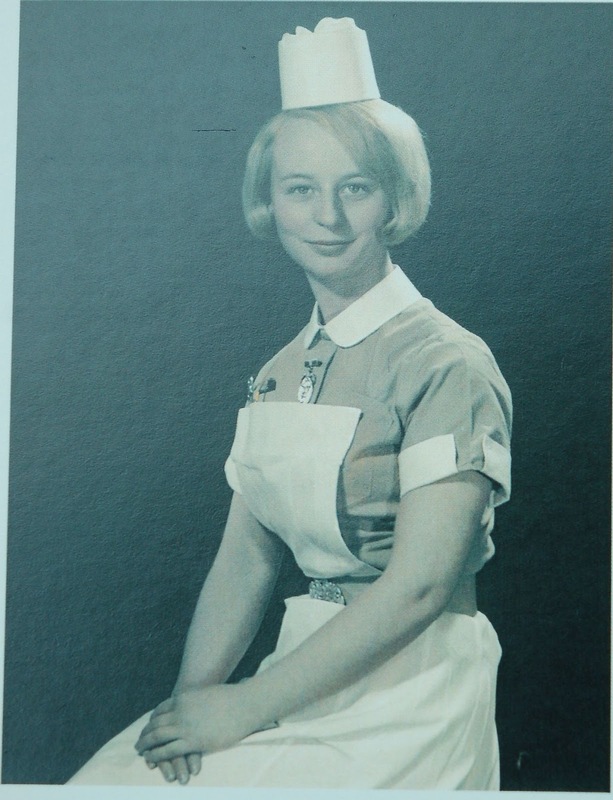 She had, herself, been a Midwife, having first trained in General Nursing, and once having achieved ‘State Registered Nurse’ status (a relative had got her into The Royal Masonic Hospital), she went on to ‘U.C.H.’ to train as a Midwife. Training at both places was demanding (R.M.H. Matron: “You go to the lavatory, Nurse, in your own time, not when on duty!”) with lectures having to be attended when dropping with sleep after a full shift on the Wards. Nurses, then, had to do all those menial tasks now considered far beneath the dignity of ‘Nurse-Practioners’ with Degrees: vomit wiped up, bed-pans or bottles brought as soon as a patient’s bell rang, beds made impeccably, two when drugs were given so that someone else could check the dosage – and, indeed, the drug – was right…dead patients laid out (in, of course, respectful silence), dying babies given emergency Baptism… To have a patient have a bed-sore meant a carpeting in front of Sister – if not Matron – ,as it was a sign of neglect of a Nurse’s duties, and, besides, ‘prevention is much better than cure’. As was the norm, in those backward times, people rose in their careers by being taught each task and every aspect of the job, in the job itself, not by being lectured and seminar-ed about a desiccated abstraction of it: the redoubtable Matron in Hammersmith could herself do everything she expected of her Staff, unlike a Matron the ‘old-fashioned Nurse’ of the title came across years later, who didn’t know how to work a blood-pressure machine, and was relieved when able to off-load this on my wife, who happened to be passing, a world away from the ‘Matron’ I was introduced to by a Nurse (who stroked the front of my jacket with unexpected over-familiarity): a balding, tubby man, who seemed aimless and undirected. For many demanding but rewarding years, this ‘old-fashioned Nurse’, did ante-natal classes, delivered babies, encouraged mothers to feed their babies, in Guernsey (where she and a colleague were astounded to find the 19th. Century still in full swing – Chloroform being dripped on to gauze…), in a rough part of Exeter (turning back a coverlet, to find a rat, extricating a baby from a lavatory-pan with mother still seated…), then in a large hospital in Plymouth, then in a small unit in mid-Cornwall. When blood had periodically to be taken from nurses, they quickly found she was the one to do it, being able to insert the needle and remove it painlessly, and without causing bruising; patients, similarly, appreciated her sensitive skills (she was once carpetted, because, finding that a discharged patient had left behind his ‘TTO’s – medicines necessary ‘To be Taken Out, had gone out of her way to hand-deliver them to his house!). I have uncovered plenty of testimonies (she never mentioned them) – patients writing severally and individually, commending and thanking her and it was at a private hospital in Windsor that she, together with one colleague, was awarded the title given to this piece (“You’re what I call an old-fashioned nurse!”). Sadly, her own later experience of other nurses, was rarely of that order: in an Exeter hospital, it seemed as though, knowing that she was ‘an old-fashioned nurse’, they went out of their way to ill-treat and humiliate her; lastly, when patently dying (in a Cornish hospital), one nurse took it upon herself to deliver a party-political broadcast about the iniquities of the Tories, accusing the Minister of Health of being in the pay of shadowy business-interests, all the while, emphasising her points by alternately thumping the bed-rail with her hands or her generous midriff: was she unaware of the fact that hearing is the last sense to go? – or was it endemic with her just to treat patients with casual disregard? Closing and demolishing older buildings, and erecting instead new brutalist ones, enabled the High-priests of ‘our N.H.S.’ to obliterate all memory of what had gone before – particularly those inconvenient dedications to Saints, that might have betrayed the fact that the Church (not least before the Reformation, had been the spearhead of medical advance and health-care; simplifying and ‘modernising’ the uniforms of nurses, also helped remove the association with the Convent, as did superseding titles like ‘Sister’. All the Friendly Societies and local Hospital Associations became redundant: why pay a regular subscription to one, when you were already taxed for the same thing? Hospitals lost their Almoners, and G.P.’s their ability to adjust their fees on the basis of who could afford what. Hospitals gained Accountants and Managers; Doctors gained N.I.C.E (cf. Orwell’s ‘Ministry of Truth’).